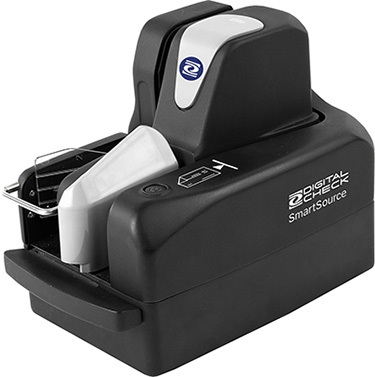 Northbrook, IL, November 13, 2018 – Digital Check (@DigitalCheckUSA) has added a new model to its line of network-ready scanners, introducing the SmartSource Expert Elite with USB Mode. The new device can operate either as a network-attached scanner using an Ethernet connection and browser-based interface, or as an ordinary scanner using a standard USB port. The dual capability is ideal for banks that want to be ready to convert their branches to a virtual desktop environment in the future but need to replace their teller equipment to operate as traditional USB-connected scanners prior to the conversion. The new Expert Elite requires a simple one-time firmware update to switch from USB to Ethernet mode; however, most banks will only need to make such a conversion once. The scanner’s API and drivers are contained onboard the device itself, keeping compatibility and integration issues to a minimum. Expert Elite series scanners possess a built-in CPU that handles image processing and compression internally, before the check images are transmitted over the branch network. This greatly reduces demands on network bandwidth and external processing power, a crucial point for teller workstations operating in virtual environments. For more information about the SmartSource Expert Elite with USB Mode, please contact your Digital Check account representative or call (847) 446-2285. Digital Check is the leading worldwide provider of check scanners and peripherals for the banking industry. Our TellerScan®, CheXpress®, and SmartSource® scanner lines provide the industry’s most reliable performance with superior MICR and image quality. Digital Check’s software delivers image enhancement and deposit-processing technologies that help clients thrive. Learn more at www.digitalcheck.com.